I leave my readers’ wildlife photos at home when traveling for fear I’ll lose the original emails. But yesterday I saw this by Stephen Barnard on Facebook and asked if I could use it. 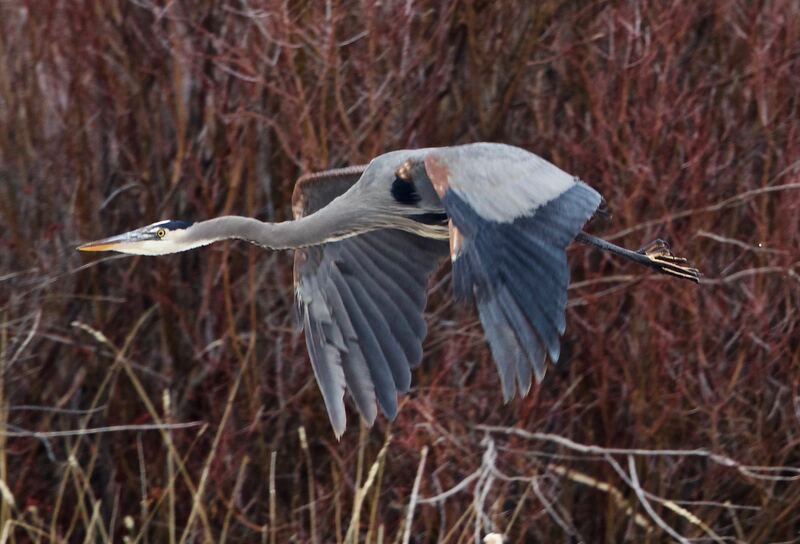 As always, he said “yes”, and so we have, from Stephen’s ranch in Idaho, a Great Blue Heron (Ardea herodias) on the wing. This entry was written by whyevolutionistrue and posted on January 13, 2019 at 8:35 am and filed under birds, photography. Bookmark the permalink. Follow any comments here with the RSS feed for this post. Both comments and trackbacks are currently closed. Had a bit of a startle a few weeks back when a great blue heron flew across the road in front of my car…at an altitude of about six feet! As always from Stephen Barnard, a superb photo! Catching the heron in flight is challenging and makes a very interesting photo. The angle the wings make, the purposeful look of her (?) head – love it. Excellent photos from Stephen, as always. Nice one Stephen. These creatures have clever looking eyes. great photo! Love a heron! Gorgeous—almost looks like a painting, and I mean that in a good way in terms of light and color. Thanks for the comments. It’s a slow time of the year here for photographing wildlife — little diversity and numbers, limited access due to snow, and usually poor light. I sense that disadvantage every day. I’m out a ways from Boise. Not as far as you are, of course, but far enough so that birds have learned to be skittish. Lot’s of hunting of ducks at this time of year. As counterintuitive as it sounds, I may have to make a trip to the city to get the best shots. Join the Idaho Birding Facebook group if you haven’t already. They’ll tell you where to go. 🙂 Wonderful group. Nice people. Thanks for the tip. I will join. I go birding with the South Idaho Birders Association. I’m finding the local hot spots. I’m hoping for some good pictures this spring. Great shot. I like the fact you can see the kink in its neck as it starts to tuck its head back.